I missed Miscellany last week; I didn’t have very many photos, and the ones I had were part of series that I wanted to post more than one image from. With the passing of summer, nature is slowing down outside. There aren’t as many bugs about, the wildflowers are largely finished. Most of our summer birds have headed south, leaving just the winter feeder visitors behind. My walks through the woods are getting quieter, and I have to make more effort to notice interesting things; they aren’t as abundant or obvious as they were. 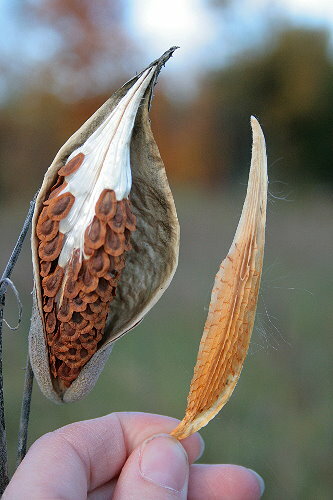 I love playing with milkweed seeds. I have a hard time passing by open pods when I’m out walking. I like the way the seeds all grow in such careful organization, smoothly layered upon each other like scales. I’ll often pull out puffs and cast them to the wind, just for the joy of it. Last week I pulled out a full, un-fluffed bunch of seeds from a recently-opened pod, such as the one shown here. I peeled off the seeds, slowly, enjoying the silkiness of the down. When I got to the end, I was left holding a fascinating structure. It was papery, with paper-thin divisions running along its length. the down of the seeds was tucked neatly into these creases, securing it until the wind became strong enough to tease it from the pod (or a person pulls them out and tosses them into the air). Presumably this is an adaptation to make sure that there is sufficient wind to carry the seed away from the mother plant when the seed falls off, and not just fall straight down. 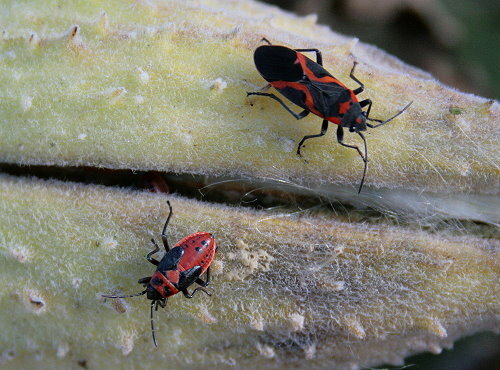 I found this pair hanging out on a milkweed pod last week. The upper one I’ve already mentioned once this fall; it’s a Small Milkweed Bug, a species that feeds on the seeds of milkweed plants. The smaller one below is a nymph of the same species. In most true bugs (that is, the group of insects that have a piercing tube-like structure for mouthparts and wings that are solid for only half their lenth and membranous the rest, leading to the group’s name Hemiptera – hemi/half, pteron/winged) the nymphs resemble wingless adults in shape but are usually differently, and often more brightly, patterned than the adults. This is a later instar of the nymph; younger nymphs are nearly all red-orange. Speaking of bugs, I have been inundated with Giant Water Bugs this evening. After a spell of cold, near- or below-freezing nights, we’ve had two in a row that have been fairly warm, up near or slightly above 10 C (50 F). Last night I didn’t realize it was so warm until well after midnight, but tonight I was prepared, and set out my moth trap for a try at late-season moths. I plugged it in just before dusk, and then forgot about it. After dinner, I put Raven on her tie-out when she asked to be let out, and went back into the house. A few minutes later she started barking in alarm. I stepped outside and could hear something rustling in the leaves at the front of the house – clearly what had gotten Raven worked up. I grabbed my shoes and went around to investigate, and it was immediately obvious what she was hearing. There were dozens of these guys, on the porch, in the garden, in the lawn, and yes, rustling around in the thick bed of leaves under the trees in front of the house. Where the heck are they all coming from? I did finally walk through the forest that borders our meadows on the west, where I’d also heard spring peepers calling a few weeks ago, but couldn’t see anything near the edge that was very wet, or even perhaps a springtime vernal pool. I’m hoping not too many of these things actually go into the trap. Another sighting of puzzling origin is this guy. I’d stepped outside this afternoon to dump the compost while I could see what I was doing (I’d created a large pile last night when I prepared and froze a batch of carrots from our garden), and right beside the porch steps was this little snake. Only 6 or 7 inches (15-17 cm) long, it was in the rocky, mostly empty soil bed beside the walkway. I quickly put down the compost and hurried back inside for my camera. At the time I just assumed it was a young milk snake. I took a few photos, then picked him up and move him away from the house. Sitting down to blog this evening, I had another look at him. Eastern Milk Snakes usually have a pale Y-shaped mark at the back of their head and this one didn’t have that. I wasn’t sure if that was because it was a juvenile, or because it wasn’t a milk snake. Some poking around suggests the answer is the latter. 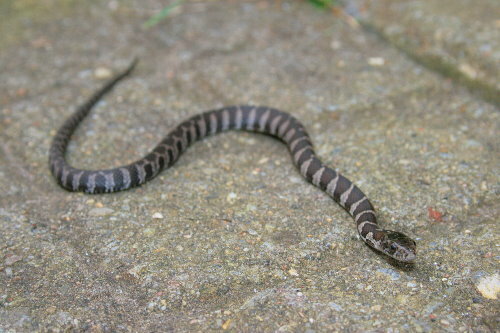 I believe this is actually a young Northern Water Snake, Nerodia sipedon. Although adults tend to remain closely associated with water, juveniles seem to often stray across land, perhaps as they disperse looking for new water to colonize. The solid bands in the front half, turning into a checkered pattern in the back half of the body, seem to be characteristic of the species. I found this caterpillar clinging to the inside of the porch screen last week. I’m not quite sure how it got in, but it was a very chilly day, and it wasn’t up to going anywhere further. I took a few photos, and then put it outside where it could hopefully find a more appropriate place to hole up. 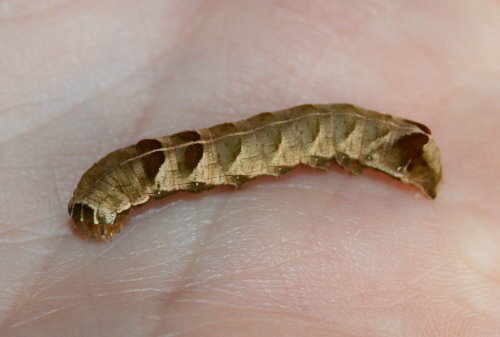 I believe it’s the caterpillar of a Hitched Arches, Melanchra adjuncta, a species of moth. I’d encountered the adults at the lake house last August (2008), and then again in May (this year). I caught one again this summer, after moving to this house. The species is found across much of North America, and flies for much of the year, May through September. Presumably they overwinter as caterpillars or pupae, thus delaying their appearance in spring. We’ve had a couple of hard frosts now, and even the frost-hardy plants have wilted away. 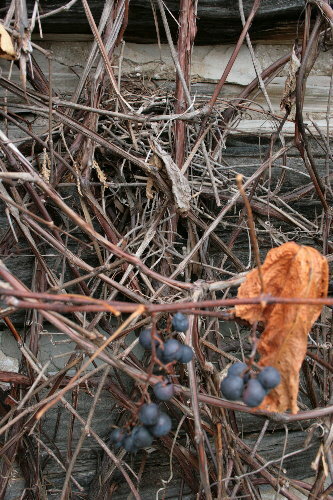 The grapevines are nearly bare of leaves, exposing the clusters of dark blue Concord grapes, and the mass of woody stems twining and crawling and sprawling across the side of the shed. As I was standing looking at the vines, thinking I should collect up some of the remaining grapes and freeze them to make pie with this winter, I noticed a clump of twigs tucked into the back of the tangles. Looking closer, it turned out to be a nest. It was quite large, appropriate for something robin-sized. It had probably finished up and fledged its young before Dan and I moved in in July, assuming it was even from this year. Determining the identity of the builders of nests can be difficult, with the exception of a few distinctive species (such as robins, or swallows). I’m not sure what species this one belonged to, although if I had to hazard a guess I might say Brown Thrasher, which build chunky, twiggy nests, usually on the ground but also sometimes tucked into thick shrubs or vines. Nearly all of our leaves have fallen now, and they form a thick bed across the lawn under the trees. I was tempted to rake them up today, if only because it was such a nice warm afternoon and it would be a reason to be outside. I didn’t, however, instead tossing the ball with Raven and Dan. Here Dan’s commanding Raven to “Drop it!”, which she does, though generally only after a good bit of bounding about in circles playing keep-away. 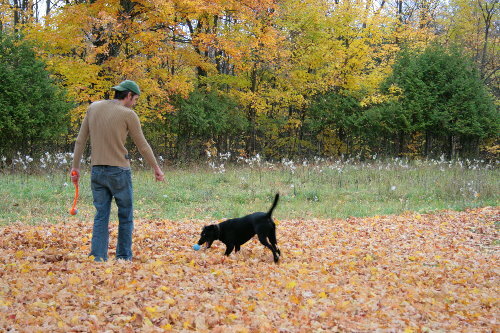 She tosses up sprays of leaves like she’s running through water. A few more weeks and we’ll be feeling less inclined to stand still and toss a ball around outside. Day 5 on the Kolibri Expeditions’ Manu bloggers’ tour takes us to Cocha Blanco (roughly translated to “White Lake”), an old oxbow lake that is now home to waterlilies, sunken logs, fish – and a family of Giant Otters. The largest species of otter, and by extension the largest species of mustelid (weasel family), it lives up to its name with males reaching 5-6 feet (1.5-1.8 m) in length. In some areas, and historically, it was also known by the name of “River Wolf”, for its huge size and carnivorous habits. Like other otters, they’re highly social, living in family groups and vocalizing frequently. Unfortunately, it is now endangered, primarily to habitat loss, with nearly 80% of its original South American range now unsuitable. Because their occurrence tends to be so patchy, population estimates are hard to make, but are thought to be less than 5000 individuals. Suriname and the Guianas are the otter’s stronghold, with a scattering across the rest of northern South America. The promotion of responsible ecotourism can lead to habitat conservation efforts that will help this species and others. 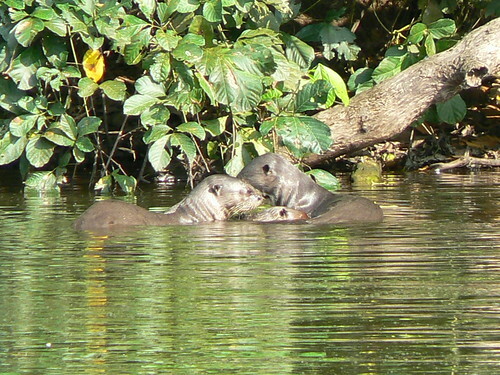 Back in January Julie Zickefoose did a great post (one of a few) about Giant Otters she saw in Guyana, which made me keen to experience these creatures. I’m going to Peru with Kolibri Expeditions as part of their blogger promotional series. Want to come? I’d love to have you along! My departure leaves November 13, 2010 and returns the 21st, well before the US Thanksgiving. You can get more information about the trip, including itinerary and, of course, cost, at this page. Don’t forget that if you’re also a blogger you get $100 off. In addition to having a great time, meeting some great bloggers, and seeing some fabulous birds, you’ll also be supporting the local communities as they work toward developing a sustainable ecotourism industry for their area. It’s a win-win! Yes, it would be a wonderful thing (in some respects) for money to not be an object. I wouldn’t’ve expected the water-creatures here, either, so I’ve been pleasantly surprised to have seen so many. Wow! 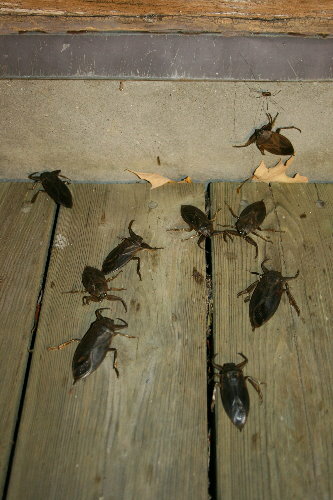 I don’t believe I’ve ever seen that many giant water bugs in one place. What a cool opportunity. And I just love the baby snake! Good eye to catch that. That photo of Dan and Raven is gorgeous. The leaf carpet, the autumnal colors in the background… Interestingly enough, it also has the rule of thirds built in naturally. Neat image!